Close To Fort Rock Park, Minutes to SHARC, Hot Tub NEW 2019 8 SHARC PASSES!! 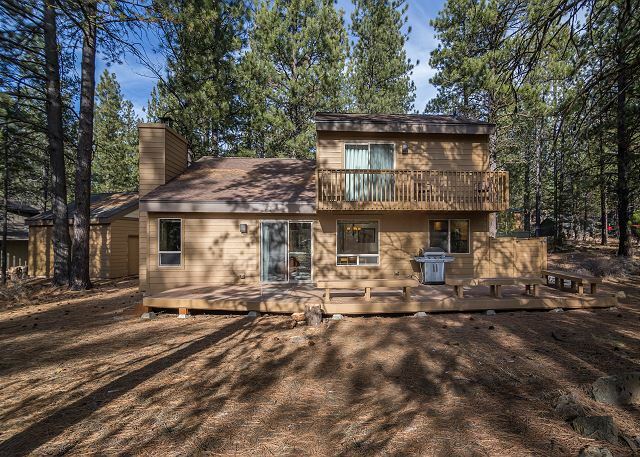 Located close to Fort Rock Park and a short walk to the Sunriver Village and SHARC water park. New in 2019 the home comes with 8 UNLIMITED SHARC passes!!! That is an up to $250.00 value each day of your stay!! Sunriver Village Mall has all your needs covered from groceries to the wonderful restaurants and shops. During the summer, the village is a great place to go for entertainment such as bumper cars, mini golf and evening live music. Ice skating is available during the colder months. If you are feeling adventurous, you can book tours and activities of all kinds -- kayaking, skiing, fishing, biking -- at locations through the Village. Mt Bachelor is 25 minutes away! It is not possible to be bored in Sunriver! Want get out on your own, take out the 18-20 ft aluminum canoe to the river or one of the many lakes, grab a lunch and enjoy some peace and quite. Two oars, 7 flotation cushions, 2 adult and 2 children life preservers are provided as well. 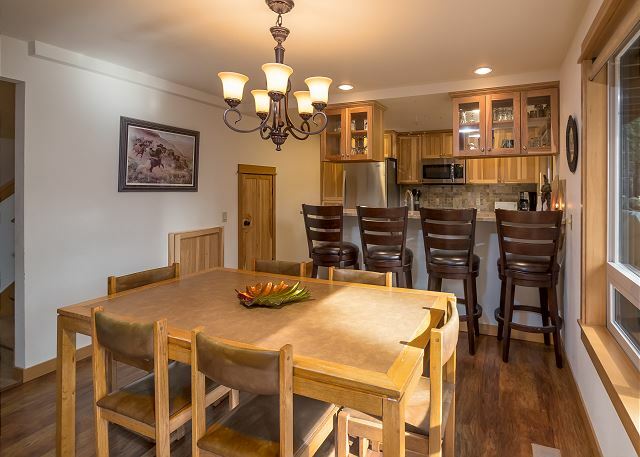 Fully equipped kitchen, dining area is large enough to fit your whole group not only for meals but enjoying game night. 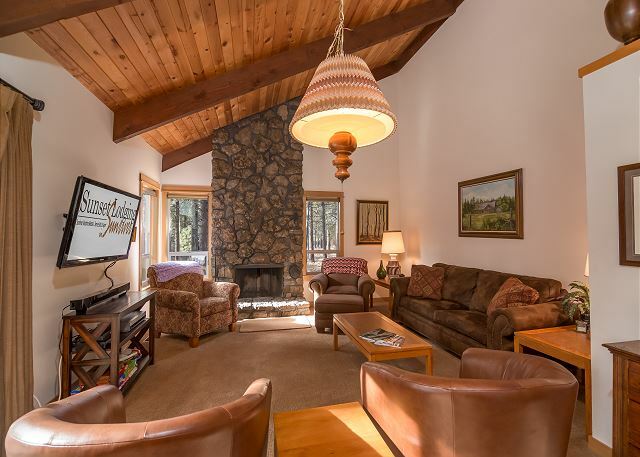 The welcoming living room has a floor to ceiling rock fireplace so you can sit and relax in while reading a book or watching a movie. 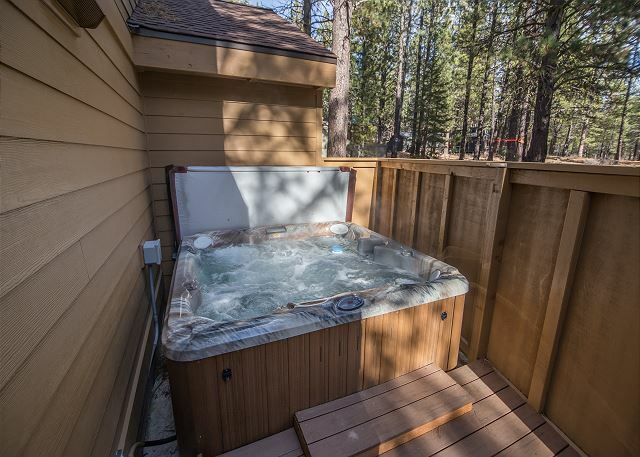 Extended living on the back deck and private hot tub for relaxing after a long day of exploring Sunriver Oregon. 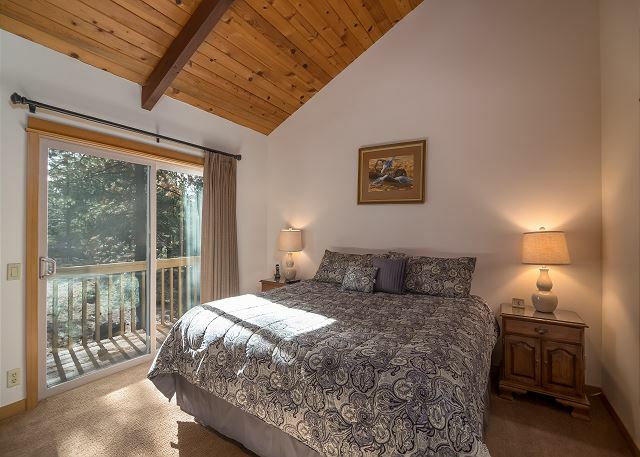 The master bedroom is upstairs with a deck overlooking the back common area. Three bedrooms downstairs. We loved our time at this rental! It was the perfect size for our family of 3 couples + 3 kids. It was very obvious the house was professionally clean, much appreciated. The back deck & hot tub were great with a view of the trees behind. Only issues we saw were some peeling of seat cushions in the hot tub + the toaster is broken. You have to hold the handle down the whole time you're toasting. This definitely needs replaced. Otherwise we had a wonderful time & will definitely be returning. Thank you! Thank You for the 5 star Review, Grace! So glad that you enjoyed this wonderful clean getaway! Glad that you had a great time and will return. We will replace the toaster per your suggestion, please do not hesitate to give us a call if ever you find something like that again and we will bring a new one to you! See you in Sunriver! Everything was in very good shape except the carpets which have had a lot of use and should be replaced (otherwise I would give 5 stars). We liked the layout and it had everything we needed. It was very comfortable for us (4 adults and 4 kids). This unit did not have air conditioning which was not a problem b/c it is well shaded and it cools off a lot overnight, they provide fans if you need them. Unfortunately for our stay there were a lot of forest fires in the area and the smoke was sometimes really bad. Checking in and out was very easy. I would come back. Thank you for your review Lynal. This summer was horrible for smoke with the wildfires and apologize that you were here during that time. I will pass along your feedback about the carpets to housekeeping to see what we can do. We're glad you enjoyed your stay overall with us and hope to see you again. Thanks so much for the great review and HAPPY ANNIVERSARY! We are so delighted that you enjoyed your stay and hope you come back and visit us again! We had a lovely time ...the location was great and house comfortable. Shark passes, some regular size forks, fans, and a crock pot would have been nice. Especially the Shark passes if you have young children. The agency told us there were fans and crockpot - turned out not to be the case. Hi Bob! Thanks so much for the review. Most of our homes DO offer SHARC passes, but unfortunately Quartz Mt 16 is not one of them. We were completely booked the week you stayed, but if you book early next time you should be able to get a home that includes SHARC passes. As far as the regular forks, fans and crockpot, we would have been very happy to deliver them out to you and will make sure that we go over to the house and get them added back in. We hope you come back to Sunriver and stay again soon! Thanks for visiting Matthew! Please come back again soon, and don't forget you have a Summer Rebooking Special offer to use if you'd like to book your Summer 2017 vacation by 9/15/2016! We had a Family reunion for 23 - 3 generations. Rented 3 houses. - worked out fine. Quartz Mtn needed a mop! Thanks for sending us your feedback Judy and Joel! We hope you'll get back to Sunriver soon. 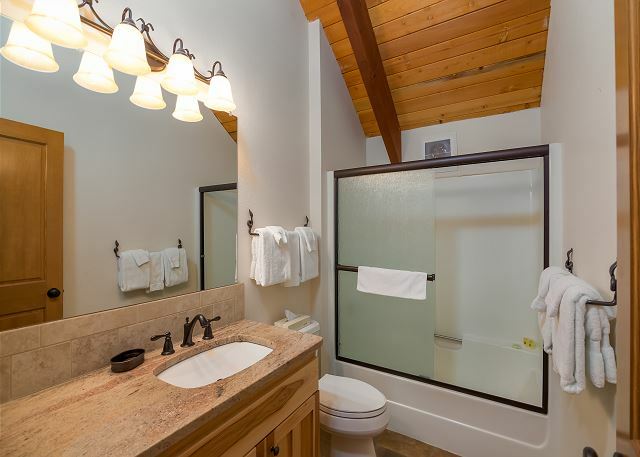 the house was great,very clean, the hot tub was super. They have a lot of storage space in the kitchen and very few supplies. need a lot more pots and pans. need a non-stick pan for cooking eggs in the morning. could use more/better dishes. go to target and buy the $200 kitchen set and the house would be perfect. Anna, this is great info!! Thanks for sharing it, we'll take a look at the dish inventory for sure. We hope you'll be able to get back to Sunriver soon! We really liked this cabin. 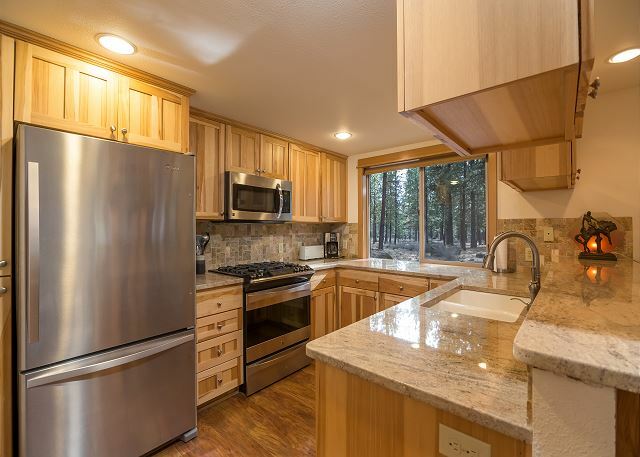 The kitchen and upstairs were recently remodeled and are great. The walking proximity to SHARC and the Village is awesome (probably quicker to walk than drive). We were cooking Thanksgiving and found the pots/pans/knives to be a wee bit lacking. Pet and kid friendly, but in great shape. We'll take a look at the pots/pans inventory, Jenna and thanks for this GREAT feedback. Here's wishing the whole Mooney clan a happy holiday season!! We had 2 families (8 of us total) staying the week in this house and we all agreed that it was a very comfortable, well-located, well taken care of house. Great space between house and bike trail. 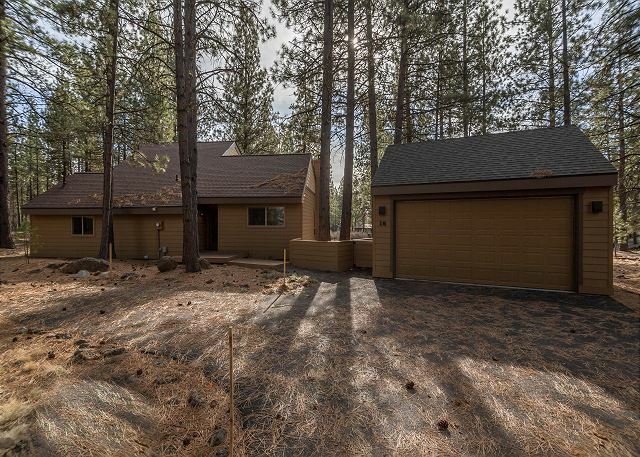 20 minute walk with dogs to Village; close to SHARC, close to Fort Rock Park. Able to get everywhere easily by bike. Will seek this house out again for our next visit! This is great to see, Nicola! 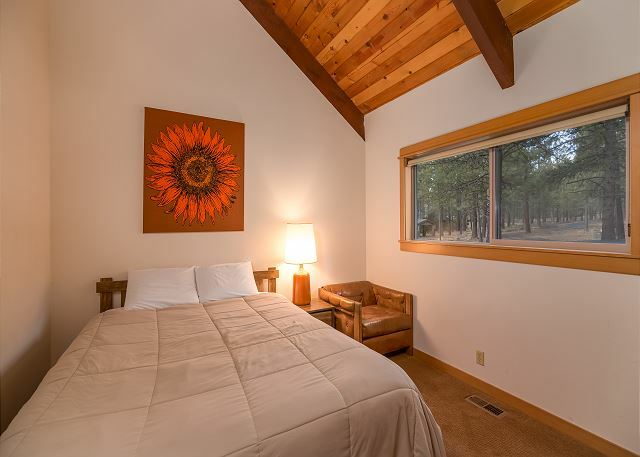 And don't forget, as a Sunset Lodging 'Summer Local", you get a great discount on a rebooking for next year, so be sure to get your space by 9/15/2015! Thanks again for being great guests!! The house was very nice. We loved the updated kitchen and the lovely deck. We did wonder if the carpets had been cleaned lately--seemed like their might have been some pet residue. We had a great visit in Sunriver - a trip with my mom, my 2 sisters and our kids - we had a great time at Quartz Mt. 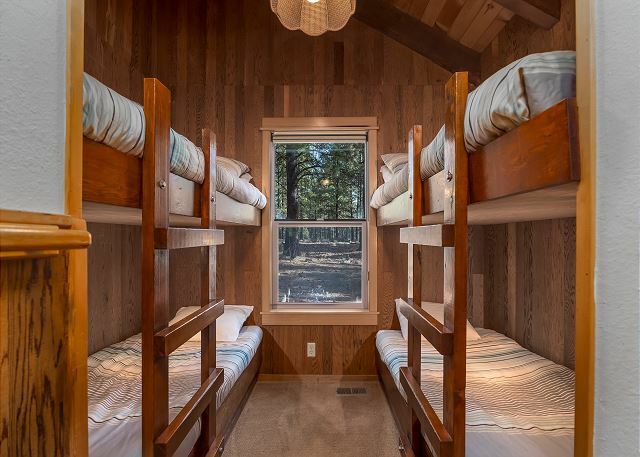 16 - the bunk room for the kids was perfect - cozy and fun! The other bedrooms were perfect and fit us all well. The living space was plenty spacious and the house was well stocked. The location near fort rock and right on the bike trail was great - very close to sharc and the village by bike or walking. Over all the house was charming, clean, comfortable and perfect for us. 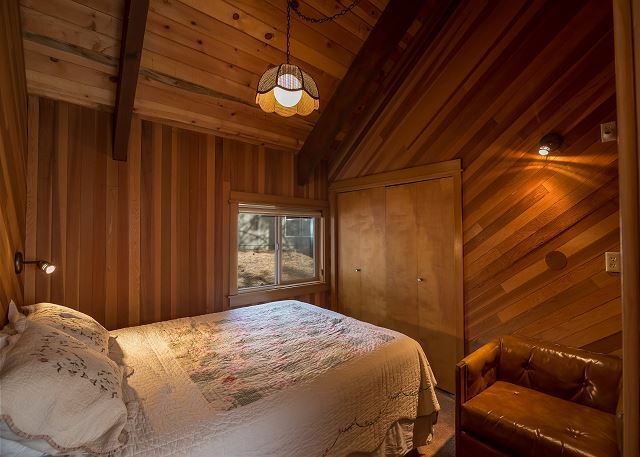 It's definitely not fancy - more of a comfy, cozy cabin feel. We loved it! And, Sunset Lodging was AMAZING to work with and VERY accommodating - thank you!!! WOW! This is all such great news, Sara! Mostly the part about your family fitting into the home well, as this is the core of our mission. We would LOVE to have the opportunity to host you again, so please keep us in mind for your next visit and please make that visit soon! Thanks again for the great feedback. The property very well accommodated our party of 10. We had beautiful weather and were able to have good days spring skiing at mt bachelor. We had children with us and loved the privacy of the large yard. The house had EVERYTHING we could possibly need!! Loved the hot tub which worked wonderfully. We were glad to see a 15" blanket of fresh new snow a couple of days after we arrived. The house was nice and clean, the only issue we had was limited kitchen supplies (pans, utensils and such) Made cooking a challenge. We are so glad the weather cooperated for you during your stay! Next time please call and let us know what items you are lacking and we can get most items to you :) Come back anytime! Ten of us (4 adults, 6 kids) had a great time in Sunriver. This was a great house for our needs. Had a great time liked the updates done to the home. Would stay again. Would like a couple fans and updated bedding size in master bedroom. Queen size on King size bed. Thank you for staying with us, we will let the owners know of your reccomendation. We really enjoyed our stay at QM16. The house appears to have been recently refurbished so it was very nice inside and out. The kitchen has the bare necessities so if you think you might need something special I suggest bringing it. Our stay was in the middle of July when the typical daytime temp was 86 and the house would get pretty warm. We were able to cool it off at night but I would recommend bringing a fan or two. It's location is very convenient to the SHARC and Fort Rock park. Overall a very nice home. 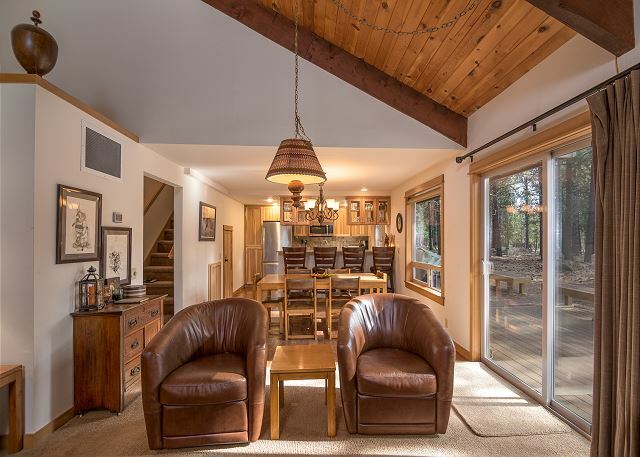 A great vacation home in sunriver, close to major attractions. This home was great. The layout, the setting, the location, the accommodations were all one of the best we have stayed in. Very close to the sharc center and fort rock park. A bike path is located right out back, and a nice quiet circle drive out front for the little ones to ride around. WE are glad to hear you enjoyed your stay. Hope to see you again soon.